Free admission! Line may begin forming at 3AM! 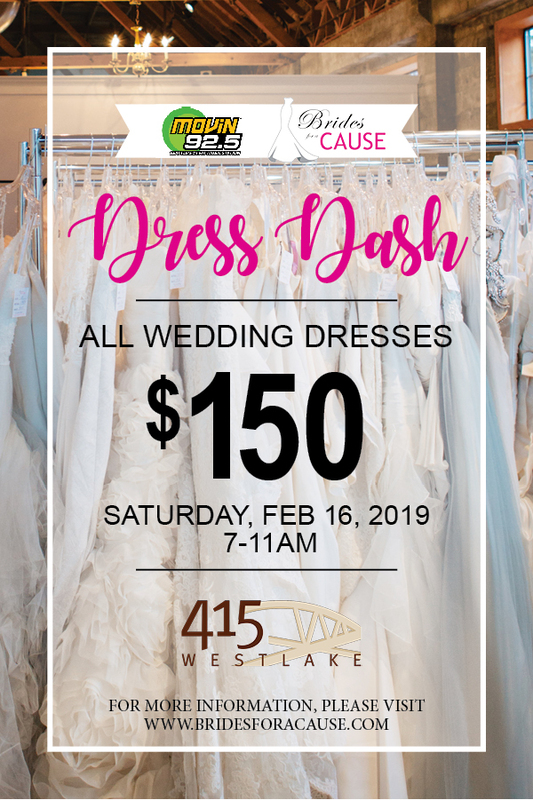 Brides for a Cause and MOViN 92.5 are hosting its 6th annual DRESS DASH on Saturday, February 16, 2019 from 7AM-11AM at 415 Westlake in Seattle! This discount wedding dress event will feature more than 500 wedding dresses – all priced at just $150! How early will you show up? Looking for a designer wedding dress? Please keep in mind, this is a clearance event to help “clear our racks.” We also have permanent bridal stores in Portland, Tacoma and Seattle, which “houses” all of our inventory, including designer and new arrivals. Learn more about visiting our Portland Boutique, Tacoma Boutique or Seattle Boutique! Street parking is available. There are also three parking garages within a 1-2 minute walk offering parking for $2.47 for all day Saturday parking.